I recently attended the Leveraging Learning conference in Auburn where I had the pleasure of attending a session by Katharine Hale on digital note taking. Similar to traditional sticky notes, "diginotes" are simply any digital board that allows students to add, collect, and move text, audio, or visuals in one space to analyze text, make connections, or demonstrate their understanding of a particular strategy. The digital board can include features such as sticky notes, text boxes, arrows, or index cards. Padlet, Book Creator, Popplet, and PicCollage Kids are all great places to create diginotes. Diginotes are a fun alternative to traditional sticky notes and it comes with the added bonus of providing students with more space to elaborate on their ideas. Diginotes also make it easier for students to support their ideas with visuals and direct evidence from the text, whereas traditional sticky notes can be difficult to interpret and can get tucked away in the pages of a book making it challenging to see the flow and connection of students' ideas. Have you tried digital note taking with your students? You may be surprised at how motivated your students will become to dig deeper into their reading with the aid of digital tools. The students in Miss Nappi's 4th grade class are learning more about each other and technology with an engaging app smash. Miss Nappi asked her students to write a bio poem to describe themselves to her. After writing detailed bio poems, we showed her class how to create a word cloud of their poem using Word Clouds by ABCya. Next, the students learned how to create a Chatterpix of their poem, and, finally, we showed the class how to upload their work to Seesaw. By adding their work to Seesaw, the students were able to quickly share their projects with not only Miss Nappi, but also with their families! This technology adventure allowed Miss Nappi's students to express themselves in a creative way and also familiarized them with an efficient workflow that will make Miss Nappi's job of documenting student progress and providing meaningful feedback a whole lot easier! Partnering with Miss Nappi was a fun and meaningful experience for all involved. Click here to see an example! If you'd like to try a project like this with your class, be sure to invite me in! Who doesn't want their students to easily create awesome looking projects? PicCollage Kids is a FREE app that allows your students to quickly and easily create. Simply choose a layout and then add pictures from your camera roll or from the web, add text and a background, save your project to your cameral roll, and then upload to Seesaw! Check out this gif for a quick tutorial. In PicCollage Kids, students can explain their thinking, map out story elements, share research, create a book snap, document a field trip, I could go on and on! The possibilities of this creation app are literally endless! Email me if you'd like some help with a PicCollage Kids project. Do you love using Epic! in your classroom? (Click here if you're not sure what Epic! is) Do you want another reason to love it even more? Then join our BE Epic! Student Book Group! Each month the elementary tech coaches will put together a collection of books in Epic! that you can assign to your students. Along with each book, we'll provide a QR code that will link to a Padlet where your students can post their response to a question about the book. 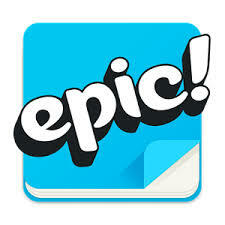 Elementary students across the district will have a blast reading in Epic! and using the corresponding Padlets to see how their peers are enjoying the books as well. Don't miss out on this awesome opportunity to hook in even your most reluctant readers. Contact your tech coach if you'd like help participating in our BE Epic! Student Book Group. We'd be happy to assist and model the process for you and your students. Stop what you're doing and check out buncee right now! Do you ever come across an app or a website and wonder, "Where have you been all my life? or How is it even possible that I didn't know about this?" Buncee is my latest discovery that goes straight to the top of that list! I'm being very literal here, I just moved Buncee to the top of my "Where have you been all my life!?" tech list in Google Keep. For those of you who haven't yet experienced the awesomeness of Buncee, please allow me the pleasure of introducing you- insert dramatic Hollywood music when you're just about to lay eyes on the love of your life... Buncee is a website/app that allows you to EASILY create, share, and present! I know, you're probably thinking what's the big deal? It doesn't sound all that exciting, but when you take a moment to browse their platform and gallery, you will quickly realize the amazing potential that Buncee will bring to your classroom and life. Their drag and drop interface makes it so easy to create multimedia slides that will engage and excite your audience. Buncee has provided a terrific platform for people of all ages to have fun while creating highly engaging and memorable projects. I'm currently using Buncee to create PD presentations, interactive lessons, book snaps, and backgrounds for green screen projects. Be sure to send me an email if you're looking for some Buncee inspiration, or would like some help getting started! Mrs. Robillard's second grade class created green screen magic using Green Screen by Do Ink! After completing a winter writing project about what they would do if they lived in a snow globe, Mrs. Robillard's students designed their own snow globes in Doodle Buddy. Then, we set up our green fabric (I realize how dreadfully wrinkled our green screen is, but we were eager to start the project and I didn't have an iron at school! It has since been ironed and looks beautifully smooth now! ), and recorded the students saying how they would spend their time in their snow globe. Green Screen by Do Ink allowed us to mesh their works of art together to create a memorable project to accompany their writing. Mrs. Robillard's class loved seeing their writing come to life with the integration of technology. Do you have your own idea for a green screen project? Email me to set up an appointment, I'd be happy to assist! The 2016 Hour of Code is coming and our Bonny Eagle elementary schools are getting ready! The elementary tech coaches, Mrs. Gleason, Mrs. Vetro, and I, recently collaborated in a professional development session to plan some awesome opportunities for our K-5 students. The Hour of Code, a movement that reaches tens of millions of students worldwide, will be happening in our schools during Computer Science Education Week, December 5th-11th. This global event was founded by a non-profit organization called code.org, which pushes parents, educators, and community leaders to give students opportunities to learn computer science, and is backed by some of the world's most powerful corporations, foundations, and individuals. Are you still wondering what's the big deal? Well, currently, there are 517,393 high-paying computing jobs available nationwide, and last year there were 42,969 computer science graduates. These computing jobs are available in every industry and in every state, and they are projected to grow at twice the rate of all other jobs! By participating in the Hour of Code, we can inspire our students to learn the language of computers, which, in case you haven't noticed, are running almost every aspect of our lives! One hour (or more) of code is a pledge that we've made to help our students learn about an opportunity that could change their lives and even the world! What are you waiting for? Visit code.org to start coding yourself. It's never too late to try!